Feb 17, 2015 - Adele Biton, 4, of Yakir, who suffered traumatic brain damage when the car driven by her mother was struck by a barrage of stones on March 14, 2013, died of respiratory complications. On March 14, 2013, Adva Biton was driving on Route 6 in the West Bank, taking her three youngest daughters home from a visit to their grandmother's house. A barrage of stones thrown by Palestinian youths at passing vehicles caused the family car to crash into a truck. All four passengers in the car were wounded. 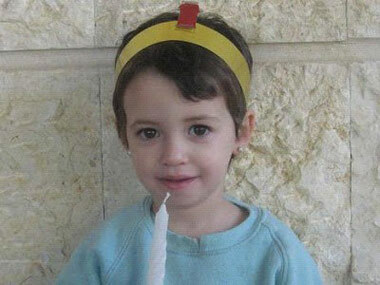 Adva and the four- and five-year-old girls Avigail and Naama were lightly-to-moderately injured. The youngest daughter, Adele, was critically injured, and remained in intensive care for months due to traumatic brain damage. At the end of May 2013, Adele was transferred in a semi-comatose state to the Beit Levinstein Rehabilitation Hospital in Ra'anana, where she remained partially conscious. In February 2014, after a lengthy rehabilitation process, Beit Levinstein concluded that nothing more could be done for the tiny patient. Caring for a severely brain-damaged child in an average family dwelling is a difficult proposition. Adele was only released home in September after her family home was fitted with the proper facilities to care for her. At the time, her mother said "Adele is still unconscious, it hurts me to see her confined to a wheelchair, not engaging with the world. She doesn't laugh, doesn't eat, doesn't do anything on her own." Her grandmother Rachel said, "Every day she was home was a day of joy. Sometimes, over the phone, I even kiss her and talk to her, and she responds with her own kind of signals." Adele Biton died on February 17, 2015 at Schneider Children’s Hospital in Petah Tikva after developing respiratory complications from a lung infection. She was four years old. "There is no doubt that it stems from the neurological damage which she suffered, which makes dealing with all medical issues more difficult. Every little thing puts her body into major stress," said her mother. Muawiya Qabha, the Arab medic who saved Adele on the night of the attack, eulogized her, saying: "Words can't explain the pain I feel and tears are choking my throat. How could a superhero be defeated? It's just not possible," he said. Adele is survived by her parents, Rafi and Adva, her sisters Avigail and Naama, and baby brother.